Preheat oven to 350 degrees F. Grease and lightly dust with flour an 11" x 17" jelly roll pan, set aside. In a medium bowl combine flour, baking powder, baking soda, and spices. In a large mixing bowl, using an electric mixer, cream together butter and sugar. Add eggs one at a time mixing after each addition followed by vanilla and milk. Stir in grated apples and finely chopped nuts (optional.) Gradually add in flour mixture until blended. Spread batter evenly on prepared pan and bake in preheated oven for 18 to 22 minutes until cake tester comes out clean when inserted in the middle. In a medium saucepan combine butter, brown sugar, half and half, and cream of tartar over medium heat stirring occasionally until butter is melted and sugar is dissolved. Bring to a boil and stir frequently for 2-3 minutes. Remove from heat and stir in salt. Let cool slightly. 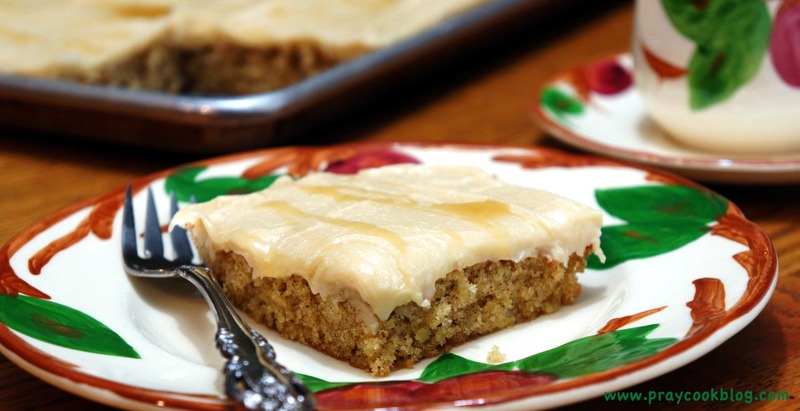 Reserve 3 tablespoons of caramel for drizzling over frosted cake. In a large bowl mix caramel with about one cup of confectioner's sugar. Stir using an electric mixer on medium speed until confectioners sugar is combined. Continue to add in confectioner's sugar in about one cup at at time until desired consistency is reached. Spread frosting on cooled cake. Drizzle with reserved caramel. This can also be baked in a 9” x 13” cake pan for approximately 35 minutes.